General The name assigned to this shirt may not be the formal one used in the solicitations. The shirt was released by Graffiti Designs. This shirt was done in conjunction with the Superboy/Legion crossover which occurred in Superboy v3 #< >, Legion of Super-Heroes v4 #< >, and Legionnaires #< >. 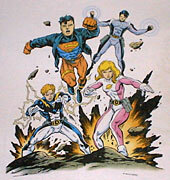 Grummett and Kesel were the art team on Superboy at the time. A fifth Legion t-shirt, with art by Karl Kesel, was solicited in 1999, but was never released. I am unaware of any artwork which was released showing the design.